From the September 2017 edition of Art & Home, Iyna Bort Caruso shows us that a library can be a true reflection of your best self. Walk into a personal library and you enter a realm, not just a room. 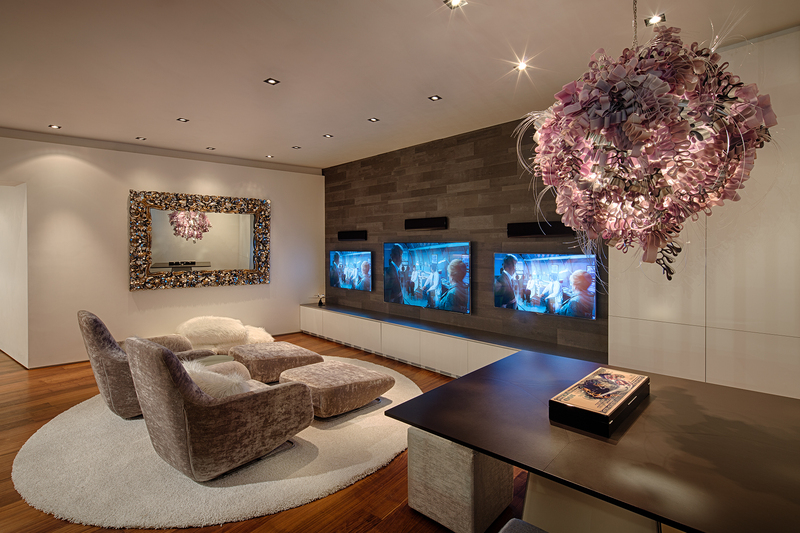 No other space offers as much insight into a homeowner’s preferences, style and intellectual curiosity. They can feel intimate and consequential. In a digital world, the idea of a space given over to actual hard-covered books might seem anachronistic if it wasn’t still so alluring. Even die-hard texters, tweeters and e-reader enthusiasts easily get swept up in rooms dedicated to stories, history and ideas. But without question libraries have evolved. Today, they’re a backdrop for entertainment and a showcase for art and design. Imagine if you could bask in the glow of the Mediterranean sunshine, embrace the tranquility of the Dutch woodlands or behold the drama of the Rocky Mountains, all while reducing environmental impact and saving money? Good news: With the following eco-friendly properties, you can. Located around the globe, each is on the cutting edge of living green by utilizing a range of technologies to increase energy efficiency and reuse valuable resources. At the same time, these properties offer the highest standards of luxury, proving that living with an environmental conscience doesn’t have to mean living without comfort. 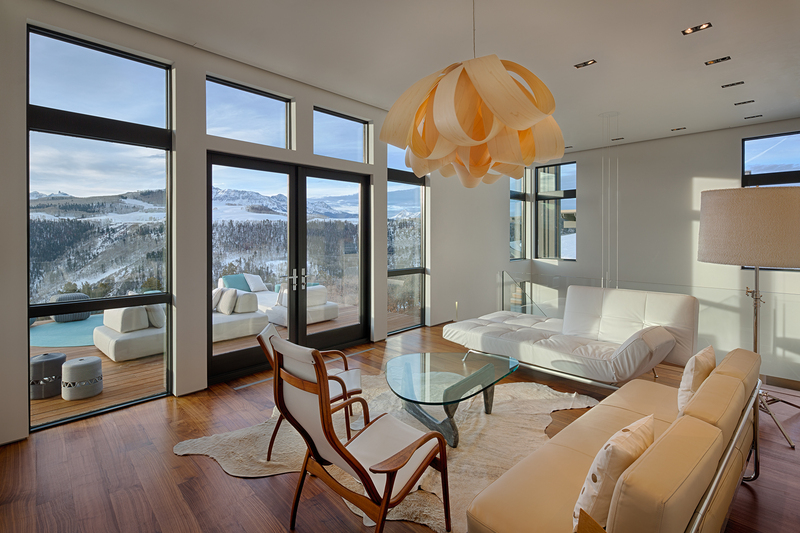 Gracefully set upon one of the most dramatic 35-acre sites in the spectacular Telluride region, this masterpiece of eco-friendly design is exceptional in its setting, quality and accommodation. 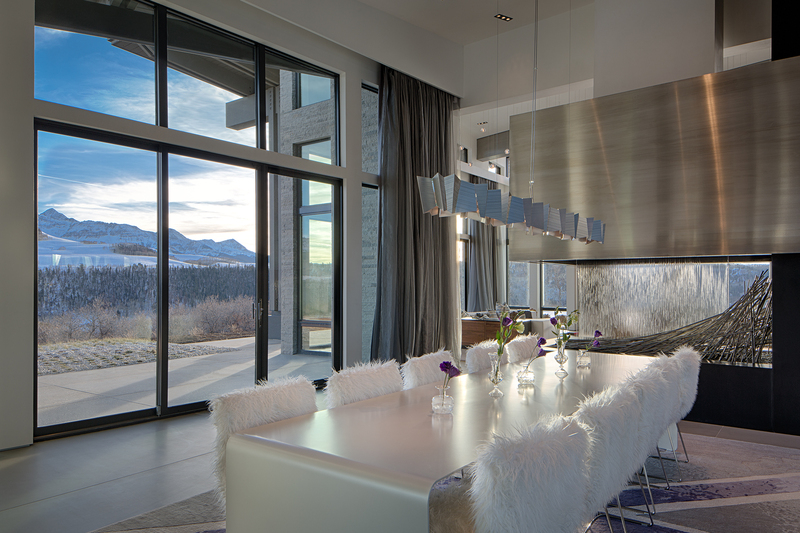 The home overlooks a reflective pond that mirrors views of a towering cirque of rolling meadows and 14,000-foot peaks, and its soaring spaces showcase the very best in sophisticated mountain living. It’s the result of a collaboration between its owners and a team of talented design and build professionals. Featuring the very finest materials from all over the world, including custom-quarried marble from Italy, limestone from India, exotic granites, bluestone and native rock, the construction process was uncompromising in its commitment to efficiency and quality. In addition, the property leverages low-voltage lighting, recirculating water features and rooftop gardens with native plants to maximize efficiency. Aesthetically, center-pivot glass doors wrap the home and give way to large outdoor spaces ideally suited for entertaining or quiet reflection. 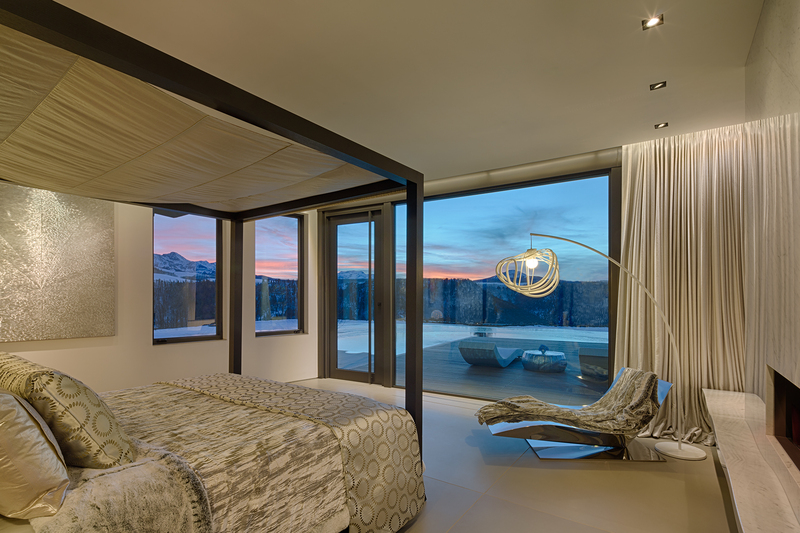 Sumptuous master and guest suites seamlessly blend intimate living areas with epic outdoor spaces. 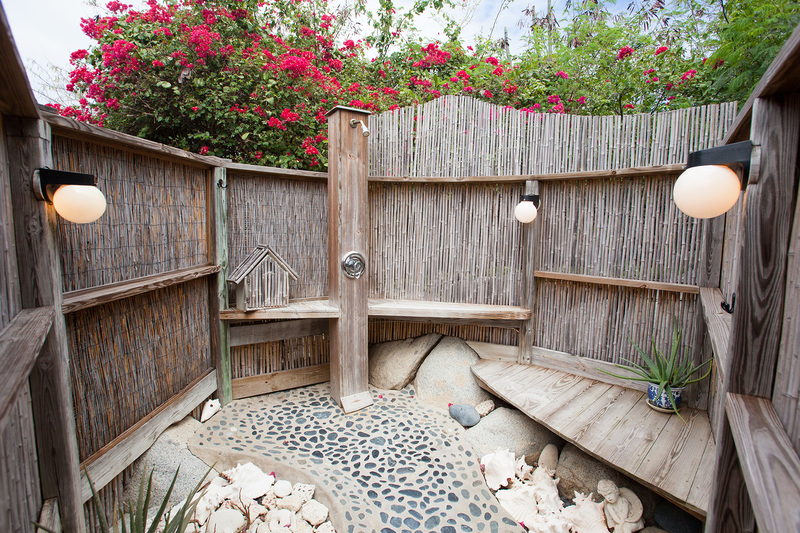 Amenities include a fitness room, spas, salon, home theater, wine room and outdoor fire pits. 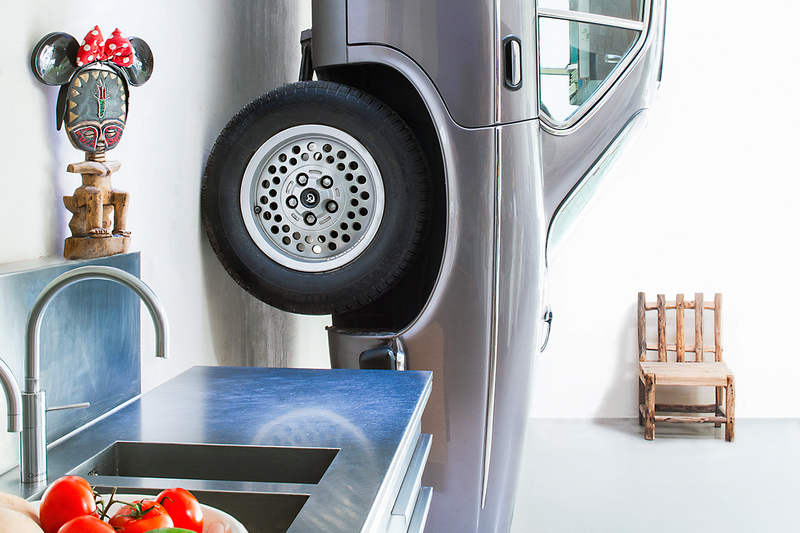 The kitchen is fit for a top chef with its suite of top-of-the-line appliances. The sum of these remarkable efforts has created a striking and efficient sanctuary nestled gracefully in the mountains — the perfect balance between privacy and proximity. This modern, spacious villa has stunning views that stretch beyond Ibiza’s Morna Valley to the island of Formentera in the distance. Located on a magnificent 64-acre plot, the property offers an eco-conscious approach to luxury living combined with absolute privacy and tranquility. The property’s meticulously designed layout consists of seven bedroom suites structured around a substantial open-plan living area. State-of- the-art sliding window systems open on extensive terracing — complete with infinity pool — that provides breathtaking views of the Mediterranean landscape. Only the highest-quality fixtures, fittings and materials were selected to ensure luxurious standards of living. 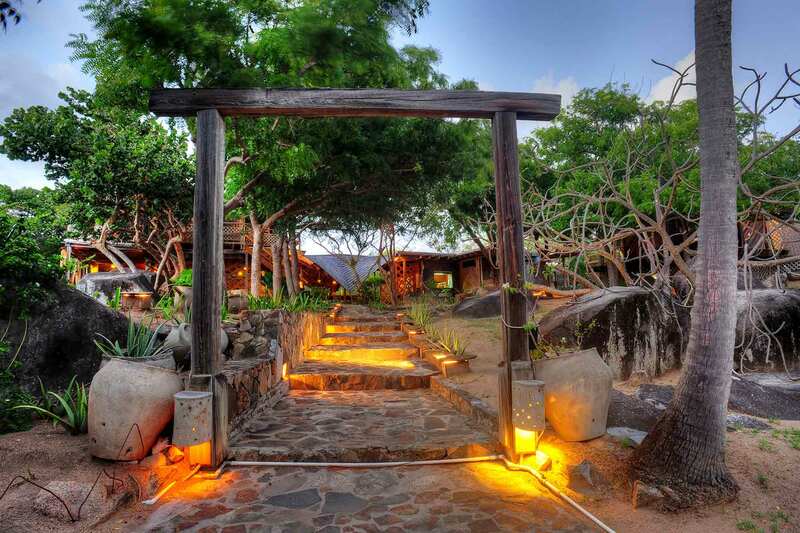 The property is largely self-sufficient, as it uses solar power and a private well. Native fruits and vegetables on the property are produced organically. 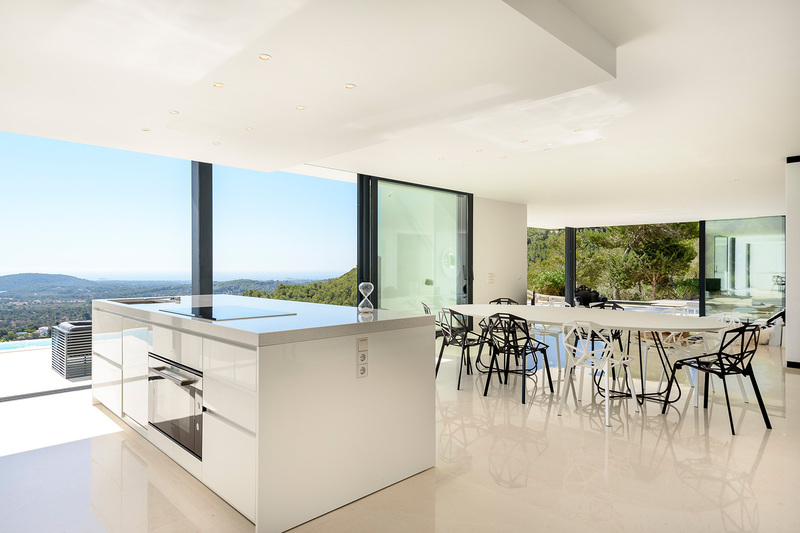 It consists of a double bedroom, living room and kitchen, and it offers an even more comprehensive view of the surrounding valley and the sea in the distance. 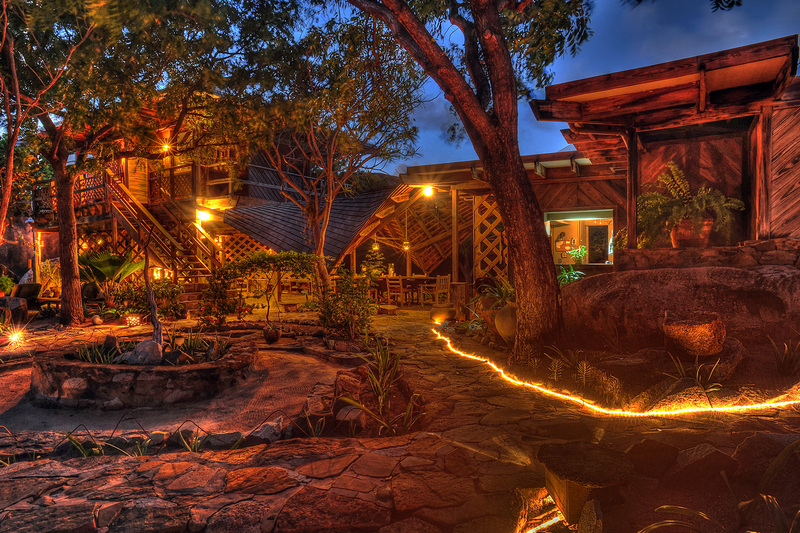 The property’s other features include an outdoor bar, a barbecue and an all-around security system, adding up to the perfect blend of seclusion, efficiency and comfort. Just a stone’s throw away from Amsterdam, on the edge of Huizen and in the Gooi Nature Reserve, lies one of the most unique houses in Holland. 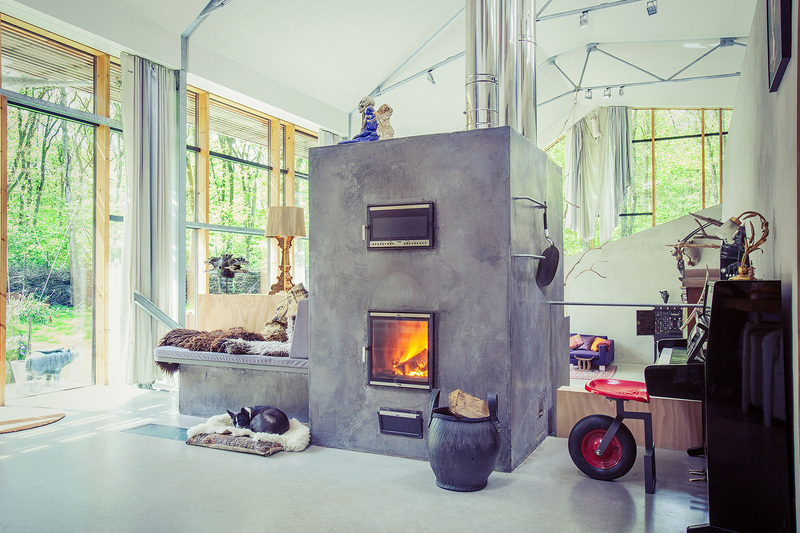 Built into the side of a hill called Mol’s Hoop, the home seamlessly blends with its woodland surroundings. The name is a play on words that references both the Dutch term for molehill and the hope for a greener future. Garnering international press, the house is commonly referred to as Dutch Mountain. Due to its unique form and hyper-sustainable functionality, it’s been the subject of a documentary and has been featured in TV shows, as well as news articles. Now, eight years since the owners — a couple who work in architecture and art history — drafted the original plans, they are offering it for sale in order to take on a new project. This self-sufficient house remains ahead of its time. With their creative and humorous approach to design, the owners used things that few would consider to create a state-of-the-art, but timeless, interior. 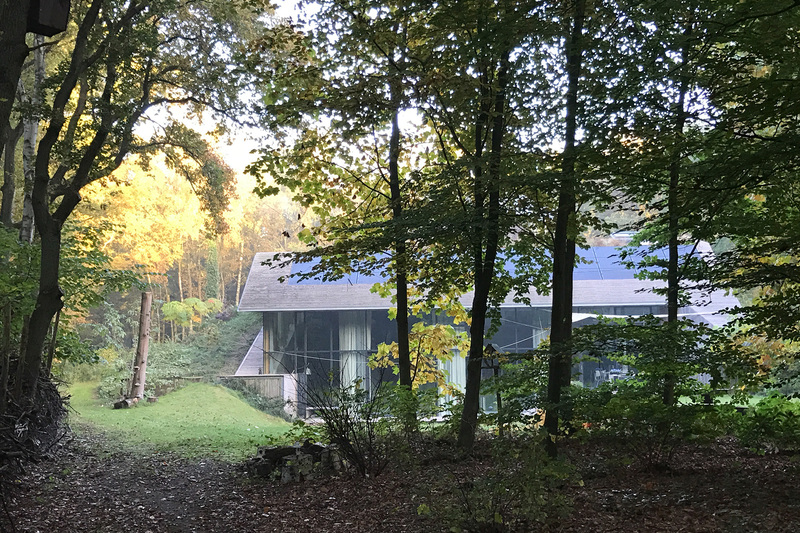 Much of the home’s efficiency comes from being built into the adjacent hill, which allows it to store energy while using passive solar technology to heat the house through the prominent glass facade. Less obvious eco-friendly features include photovoltaics, LED lighting, wood pellet heating and more. 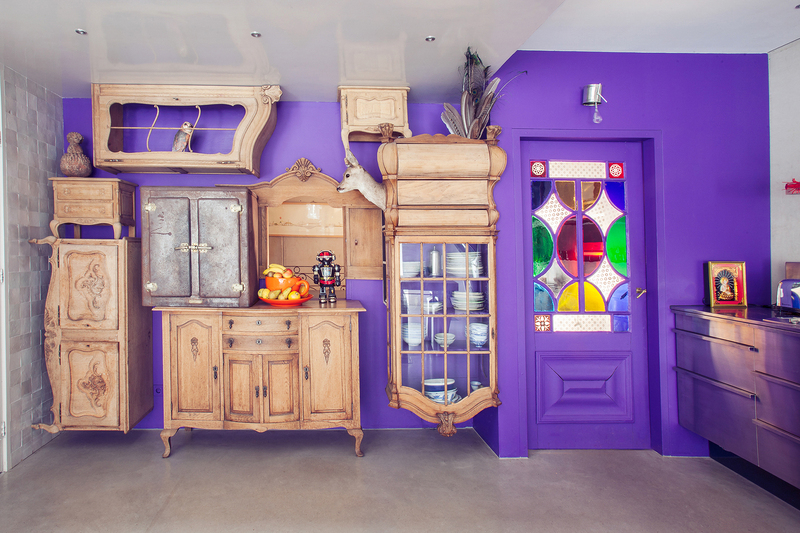 This, combined with the owners’ collection of acquired or created art and design — often made from recycled materials — complete the home’s organic aesthetic. A prominent feature is the 30-year-old Daimler Double Six automobile. After being driven by the owners for years, it has now been repurposed as a kitchen cupboard. The property also includes other custom-made furniture. With such a focus on its natural surroundings, wildlife is plentiful: foxes, owls, buzzards, woodpeckers, moles and bee colonies all live nearby. On three sides, the spacious garden merges with the woods and heaths of the Gooi Nature Reserve. Built among the mysterious boulders of Spring Bay National Park, this property seems to melt into its stunning natural surroundings. Toad Hall Estate is graced with international character and charm, and it currently operates as a popular, secluded vacation rental. While conveniently located 10 minutes from the main ferry dock in Spanish Town, the estate imbues its guests with a sense of escape via the long private driveway. Built in the original West Indian style with covered outdoor spaces, Toad Hall includes three enclosed bed/bathroom pavilions and one smaller studio pavilion. 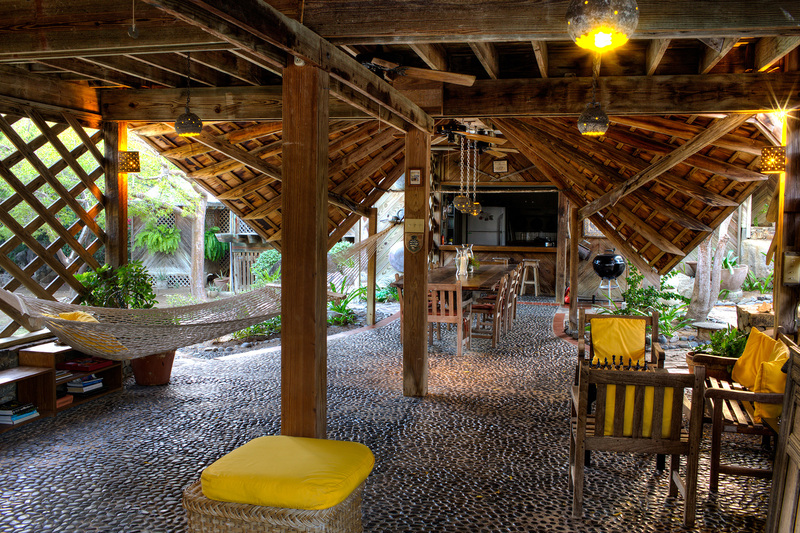 You’ll feel part of nature as the property’s unique indoor/outdoor layout allows for naturally cooling air flow. Rainwater is collected off the roof for greater efficiency, while water captured from the driveway is used for irrigation. 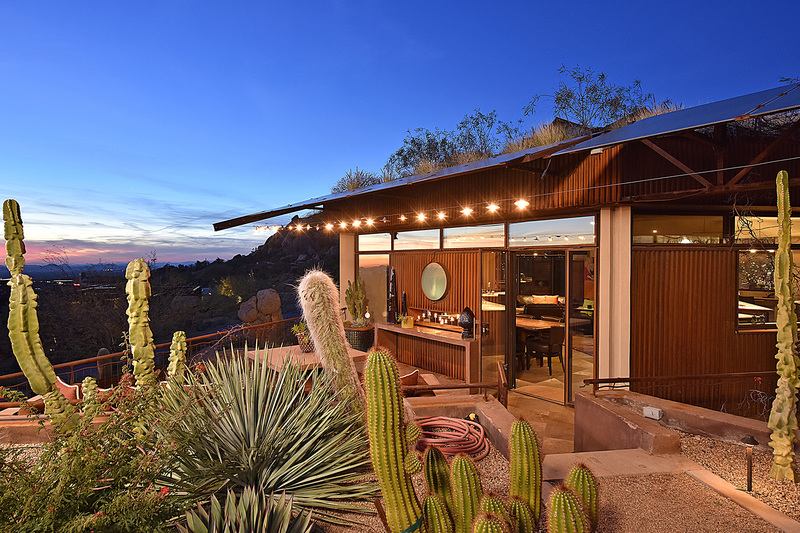 The estate was designed to allow guests their privacy inside personal pavilions, while having the option of congregating outside in the shared spaces, just steps from their bedroom doors. 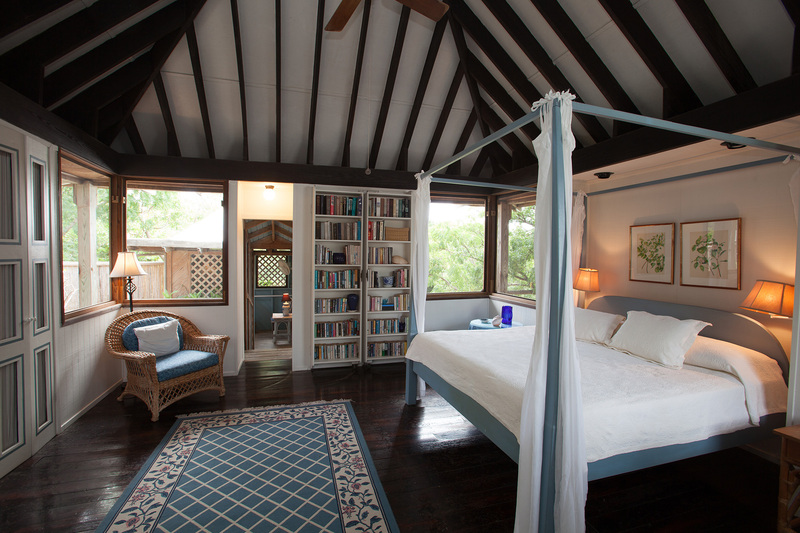 Inside these Caribbean-style houses, the rooms have been tastefully decorated with elegant, contemporary furnishings. 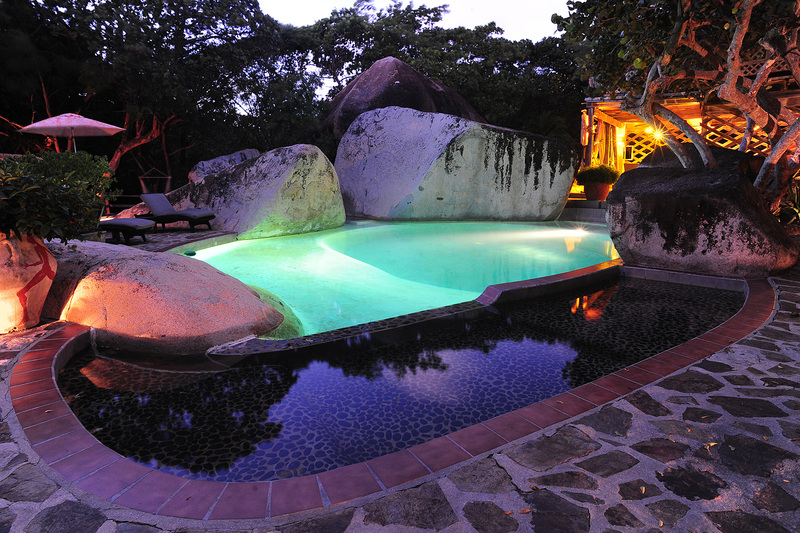 Each pavilion features an outdoor shower built between large boulders, and fenced in for privacy. Kitchen and living areas are open-plan. Taken as a whole, Toad Hall Estate is more than just an investment opportunity for deluxe rental accommodations: It is also a possible business venture for entrepreneurs who want to expand on an existing vacation villa. The villa includes its own on-site restaurant, Mad Dog. While the establishment is owned by Toad Hall Estate, the daily operations, finance and logistics of the business are managed by restaurateurs. 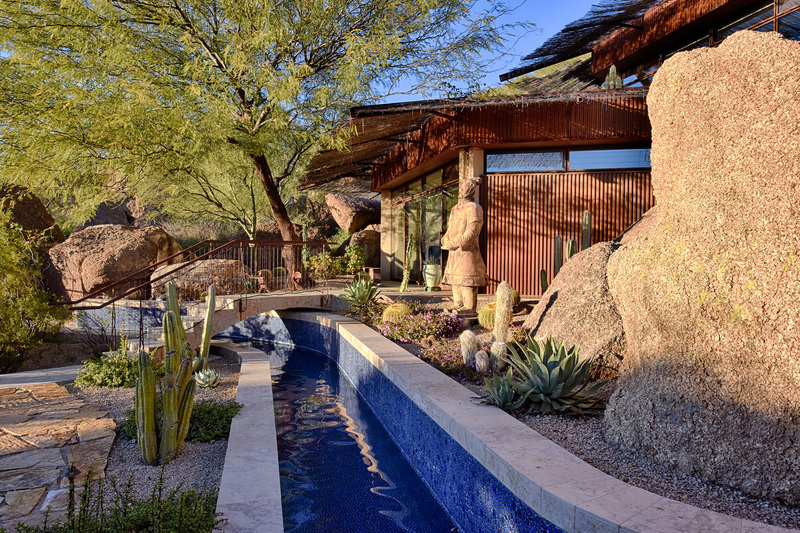 At an elevation of 2,600 feet, this eco-friendly masterpiece seamlessly integrates with the natural, boulder-strewn landscape of Troon Mountain. 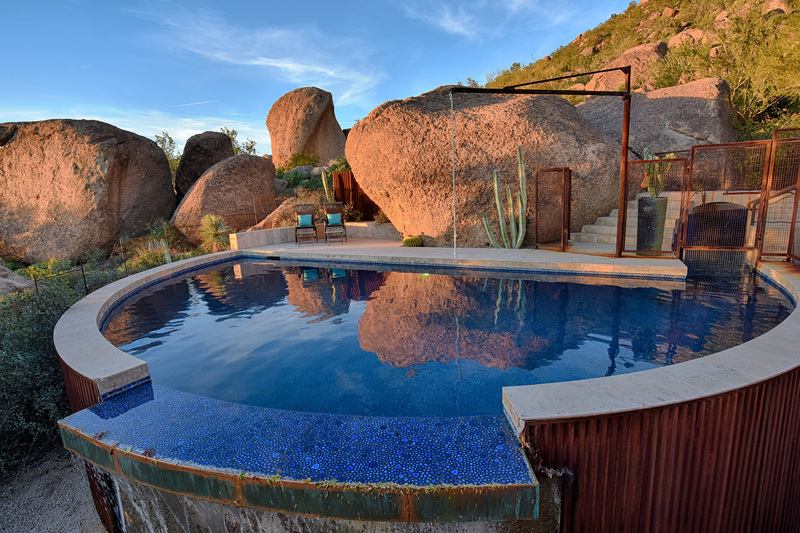 The 5,000-square- foot residence is located within the private gated community of Tusayan at Troon Village, and features extensive use of green technology. It is constructed of steel, concrete, stone and glass at different levels on the five-acre cul-de- sac lot. It boasts jaw-dropping views of the valley and mountain ranges, and it also features rooftop gardens and solar panels to increase energy efficiency. Interwoven between the buildings are walkways, staircases surrounded by foliage, exterior patios, pergolas and cabanas. A canal-like waterway feeds the pool, which features a cantilevered negative-edge water feature, spa and rope swing. In keeping with its luxurious setting, the home’s rooms — including four bedrooms, den, library, separate workshop and game room — are comfortably and elegantly appointed. The large kitchen/dining room features vinegar-stained walnut cabinets, limestone counter tops, modern kitchen appliances and dual islands. 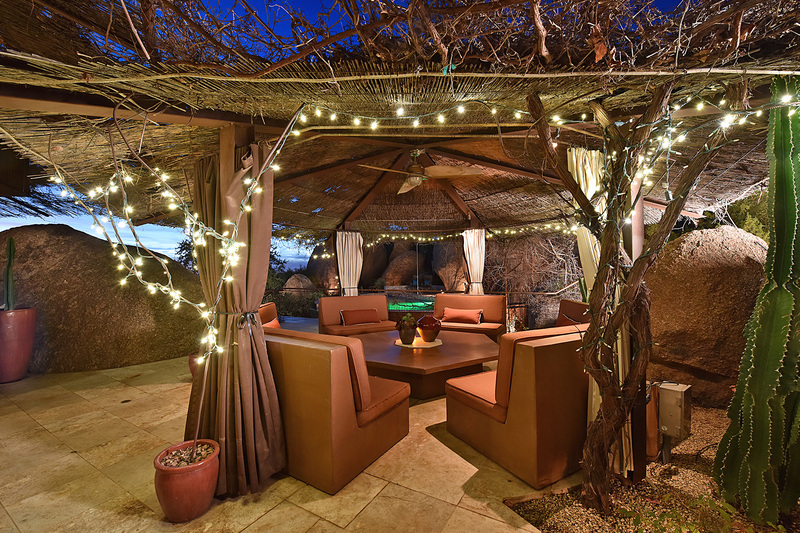 Outdoor dining is a breeze, with multiple outdoor lounge areas that include a full outdoor bar with grill. Among the eco-friendly features: clay walls, maximum ventilation with roof openings and transom windows, interior and exterior spaces designed to channel natural mountain air, solar energy, tankless water heater and decomposed granite driveway. 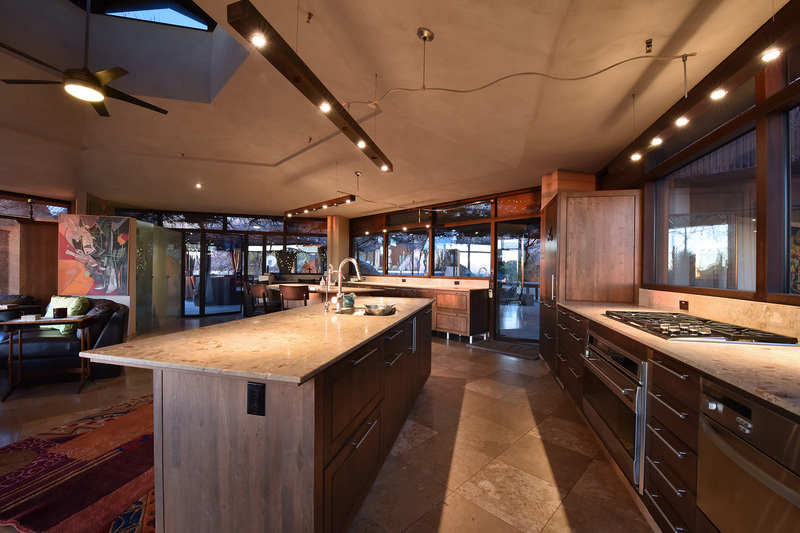 A true example of collaboration, research and forward-thinking eco-design, this is a one-of-a-kind property in North Scottsdale. Whether it’s the comfort offered in a classic flavor or a famed modernist masterpiece by Andy Warhol, the Campbell Soup Company and their iconic can are pop-cultural and culinary staples. The Dorrance family represents the heirs to the aforementioned household name brand and, as recently covered by Mansion Global and The Wall Street Journal, three of the family’s homes have recently come to market in the Northeastern United States. The first, known as “The Bird House,” is the former home Dorrance Hill Hamilton and can be found at one of the highest points in Newport, Rhode Island. State-of-the-art in every aspect, from geothermal heating and cooling to exquisitely crafted details and top-of-the-line amenities, the soaring two-story entrance hall and living room with floor-to-ceiling stone fireplace enjoy panoramic ocean views. Dorrance, or “Dodo” as she was known by her closest friends, passed away this past April at 88. Before her death, she spared no expense to create a beautiful sanctuary using all that modern technology can provide including Tischler custom windows and doors, three-stop elevator, radiant heated floors, whole house generator, and exquisite landscaping. At nearly 10,000 square-feet of living space on over three-and-one-half-acres, the home bears it’s ornithological moniker from its many bird-inspired design elements throughout. The second home, named “Linden Hill,” can be found in Gladwyne, Pennsylvania. Designed between 1928 and 1931 by Edmund B. Gilchrist for stockbroker Rodman Ellison Griscom, this French Norman-Style home was owned by the Dorrance family for over 50 years. Sprawling 67 acres, discover an initial courtyard formed by turreted caretaker’s quarters, a 10-car garage, stables and additional staff houses leads to the crest of a hill. At the end of a narrow-walled lane, the magnificent manor house reveals itself, a majestic example of inspired design of breathtaking scale and symmetry. Pass through the courtyard entry where brick chimney stacks on guest houses cleverly frame the main house, and behold a truly historic mansion, beautifully maintained with complete respect for its origins, yet offering every modern amenity. Its grand-scale formal rooms offer elegant and easy, expansive or intimate entertaining spaces. Private quarters are equally inviting with family living quarters that accommodate guests for short-term or extended stays. Beyond the main house are two pools, a pool house, tennis court and a beautiful aviary, all set within absolutely stunning gardens and grounds. Lastly, we find ourselves in Bar Harbor, Maine at “La Rochelle” – a captivating waterfront retreat and one of the village’s most treasured addresses. As covered in Mansion Global, the home is truly an iconic piece of Bar Harbor’s legacy. In the early 1940s, the home belonged to Tristram and Ethel Colket; before marrying Tristram, Ethel bore the surname Dorrance as she was daughter of John Thompson Dorrance, co-founder of the Campbell Soup Company. Built in 1902, this Georgian Revival masterpiece was the village’s first brick summer cottage. Looking out over Frenchman Bay, this sprawling home is an architectural and historic masterpiece; among its features are forty-one rooms in the 13,000 plus square-feet of living space, manicured gardens and lawn, and nearly three oceanfront acres. From a one-of-a-kind Mediterranean-inspired estate in St. Barthelemy to an enthralling Chalet in Italy’s Dolomites, this month’s collection of exceptional properties for sale feature homes from some of the world’s finest locales. Located on the craggy hillside of Pointe Milou, this one-of-a-kind home faces east and boasts sensational views and wonderful breezes. All white, with Greek, Croatian, Moroccan and Mediterranean inspirations, this villa is often featured in magazines and is suited for the discriminating buyer who requires luxury and privacy. This four-bedroom villa with pool and Jacuzzi extends over 5,400 square-meters and overlooks a bay, accessible by private path. Designed by world-renowned architect Guy Dreier and located in the exclusive covenant of Rancho Santa Fe, two-story walls of glass highlight the magnificent water features surrounding the home and showcase spectacular sculptures. A thoughtful design that perfectly melds technology, art, and natures create an unforgettable ambience; indoor and outdoor living spaces, tennis courts, zero-edge pool, staff quarters, master suite with fireplace, and meticulous landscaping are only part of what defines this masterpiece. Hacienda Three Lagos is one of the most exclusive properties in Chilean Patagonia; with more than 2,000 square-meters of living space on over 1,000 hectares of Patagonian land, the home features direct access to three different lakes. One of the property’s signature features is a two-bedroom floating cabin on one of its lakes, said to be the only floating cabin of its kind in South America. 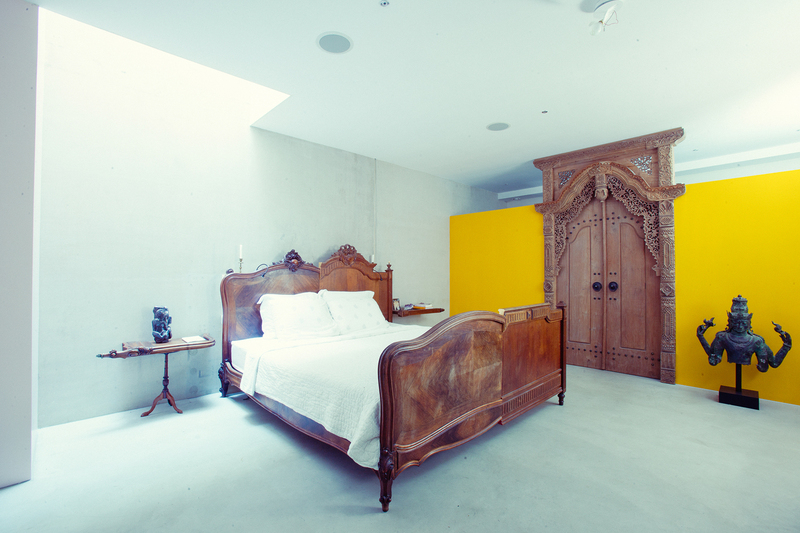 Known as the “Fondachhof,” this home finds itself if one of the finest locales within Salzburg. 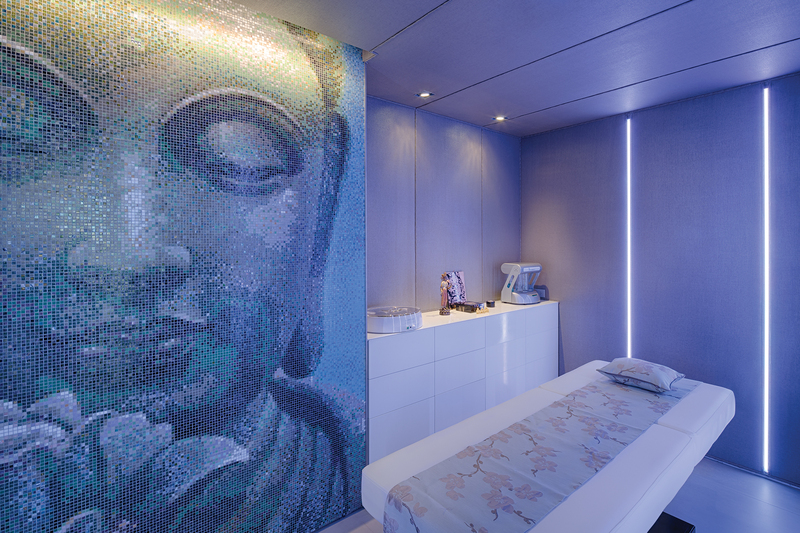 Located at the foot of the Gaisberg and embedded in a private park, this palatial residence can reach the center of Salzburg in minutes by foot. Grand landscaping, fountains, and an enclosed gazebo dot the grounds of this remarkable property. This extraordinary chalet offers the beauty and comfort found in five-star resorts. Located in the area closest to the famous “promenade” in Cortina, it offers a breathtaking view of the Dolomites and Cortina. 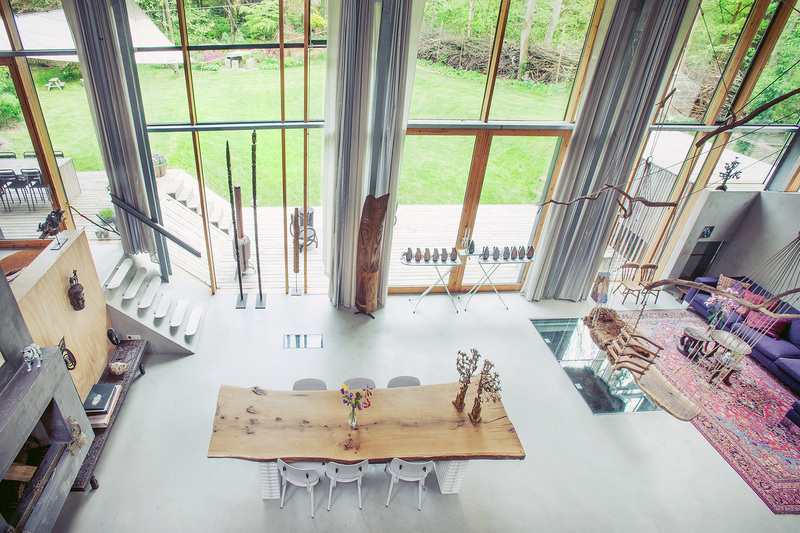 The 870-square-meter chalet is arranged over four floors served by a private elevator and a service staircase. The atmosphere is designed to welcome guests and make its host comfortable; the modern interior design elegantly combines a combination of high-grade materials and finishes. A soundproofed private cinema, home theater sound system, and ultra-ergonomic chairs brings the Hollywood experience to the privacy of your own dwelling.